In 1815, in the aftermath of the Napoleonic Wars, two of England's wealthiest lords place a high-stakes wager on whether a popular set of books, which claim that the author has traveled to many unknown corners of the globe, are truth or, more likely, wild fiction. 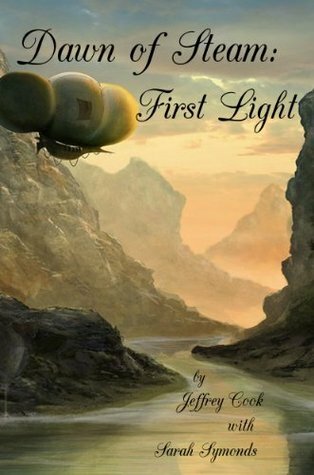 First Light is an epistolary novel, told primarily through the eyes of former aide-de-camp Gregory Conan Watts, describing the journeys of the airship Dame Fortuna and its crew through journals and letters to his beloved fiancee. The first recruit is, necessarily, the airship's owner: war hero, famed genius, and literal knight in steam-powered armor Sir James Coltrane. Persuading him to lend his talents and refitted airship to the venture requires bringing along his sister, his cousin, and the crew that flew with him during the Napoleonic Wars. Only with their aid can they track down a Scottish rifleman, a pair of shady carnies, and a guide with a strong personal investment in the stories. Jeffrey Cook lives in Maple Valley, Washington, with his wife and three large dogs. He has lived all over the United States. He’s contributed to a number of role-playing game books for Deep7 Press out of Seattle, Washington, but First Light is his first novel. When not reading, researching or writing, Jeffrey enjoys role-playing games and watching football.